Twitter made its first appearance in 2006, through Jack Dorsey’s will to put in practice his idea of an SMS (short messaging service) which would allow individuals to communicate with a small group of people. 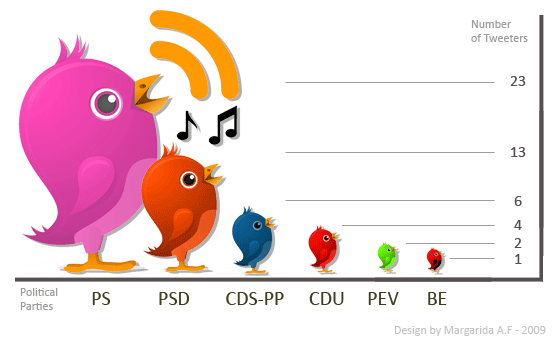 Even though it appeared in 2006, it was only in 2009 that Portuguese politicians with representative seats in the parliament started using this microblogging tool that unites the SMS with social networking. It all started in the beginning of January 2009 with the journalist Anabela Neves, working on the coverage and analysis of politics, who sent out an invitation to seven representatives and to the Presidency of the Republic to join a blog. This blog was and is called “Minuto a Minuto” (“Minute by Minute”) and exists within a website called “Parlamento Global” (“Global Parliament”), which is updated by journalists and has the objective of being a neutral space where one can follow the events related to Portuguese politics/politicians. “Minuto a Minuto” follows the political debates within the Portuguese parliament live with comments and invites representatives, candidates and commentators to actively participate. Occasionaly a group of “normal” citizens is also invited. There are several ways to participate and representatives were asked to create their own Twitter accounts, so that when they sent out new tweets, these would immediatly be visible on “Minuto a Minuto”. Even though the Presidency of the Republic only maintains a very formal participation, only revealing the agenda of the Portuguese President (our president is not Obama), for 2 to 7 representatives participating became a habit. 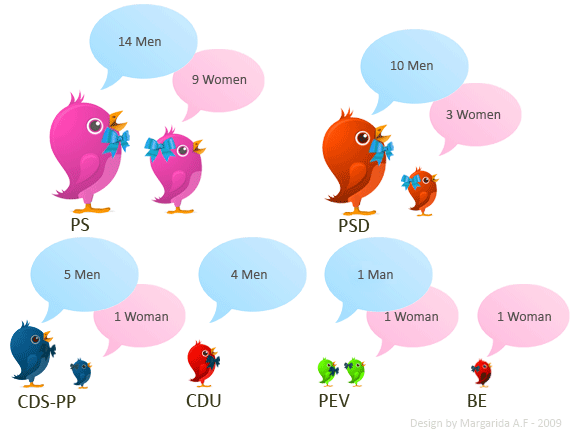 Participation started out in a shy way, but nowadays the parliament, which has 230 representatives, already has 49 active Twitters, meaning 21% of the representatives are present in the Twittersphere. But why do politicians use Twitter after all? Some politicians (Hermínio Loureiro and Jorge Seguro Sanches) defend that Twitter is an approximation channel between politicians and citizens, a barometer of the citizens’ opinion, on the hand it is also used to actively discuss with other politicians; some politicians also mention the possibility using Twitter for the current election (27th of September) campaigns. In the beginning of July a new platform was launched that aggregates the representatives’ tweets. 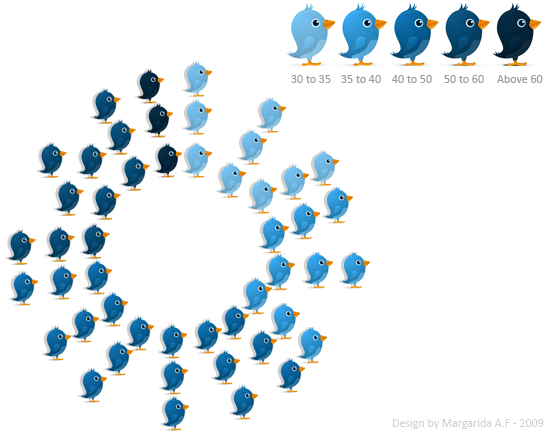 It is called “Twitica“. There is a pole regarding Twitica in Twitter, the question is “What is the biggest advantage of a representatives’ presence in Twitter?”. So far there have only been 20 answers, but the curious thing is that the most voted answer is “Understanding his/her human facet.”. It was also in July that some polemics started showig up related to Twitter and the life of national politics. What happened was that during the time of a session in the parliament, representatives use the opportunity to create parallel debates with the following added values: no time control, journalists (who have also quickly joined Twitter) can follow, and mainly, the possibility of breaking the protocol. In the parliament of Azores (Portuguese island) tension built up two times because of two comments which had been posted on Twitter by a socialist representative (Alexandre Pascola) during the session and about two other representatives from different parties (PSD and CDS). There was an exchange of accusations during the session and this representative was accused of cowardice and of using his time to participate in the session with other goals. Alexandre Pascoal refuted these ideas saying that he believes that these polemics should be traced back to a generations gap. Could it be that only the younger representatives use Twitter? As a result of these polemics, the president of the Azores parliament wants to regulate the use of Twitter in the parliament starting in September. There was another mediatic case in the beginning of July related to Twitter and our representatives in the Portuguese parliament: our Minister of Economics was fired live, during a session in the “State of the Nation Assembly”, after having made an offensive gesture towards a representative of the opposition and mainly improperfor the place he was in. Still before the minister demited himself, the subject was already being discussed in a parallel debate between representatives on Twitter. Twitter ended up giving, in a fast way, the dimension of the public opinion to what in another way might have passed as an unnoticed gesture. On the other hand what is interesting is to verify that it’s not the politicians with most media projection, or in any way better known, that are on Twitter. It would be nice to have Twitter bring a kind of dialogue approach from politicians towards citizens and vice-versa, as opposed to the monologue speech, and that our public opinion, these days not very participative in political matters, finds a way of manifesting about the state of the nation. – (For the general public) Interaction with the representatives, but most citizens can get to know the more human side of politicians, a facet until then unaccessible, and what Clive Thompson calls “ambient awareness”, in his words, “by following these quick, abbreviated status reports from members in your extended social network, you get a strangely satisfying glimpse of their daily routines”. Comment about Clive Thompson pasted from TIME. All of the graphics above were created using data from September 1st, 2009. What can wii do for us? @MOM, twitter #addmeaning or #losemeaning?